BAD!SLAM!NO!BISCUIT! launches into August The Month of Mystery. With two microphones, a stage, an audience, judges, The Score Adder, Shakespeare, Prizes and your choice of beer, cider, spirits or water and cordial or water without cordial. This is BAD!SLAM!NO!BISCUIT! and this is August the month of Mystery. This is our first mystery feature act. Not much is known about That Guy Named After an Apple, he is after all a man of mystery. But his name tells you that “That Guy” could = Dude and that “Named After an Apple” could = Pink Lady. Yes, BAD!SLAM!NO!BISCUIT! could be bringing you Dude, Pink Lady. It will be...mysterious. So bring your words ‘cause we want them on stage because BAD!SLAM!NO!BISCUIT! is a poetry slam full of mystery. 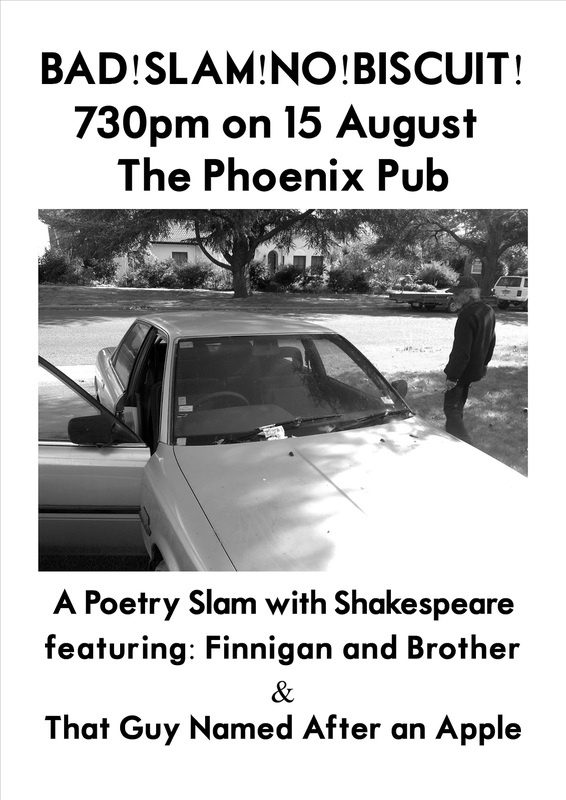 And remember, no props, original material, no music, your words, on stage, 2 minutes, at The Phoenix Pub.